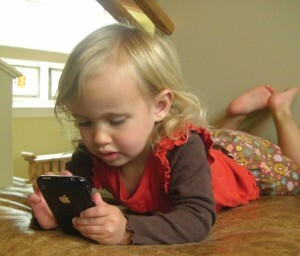 A recent Mommyish.com article featured a survey that indicated parents are issuing mobile phones to children as young as six years old. This is the big question every cyber parent must answer: when is it time to issue a smart phone to your child? There is tremendous pressure to issue mobile phones to kids at younger ages. As digital natives enter parenthood, personal smart devices are becoming the new norm at earlier ages. And still there is plenty of scientific and anecdotal evidence that too much screen time, too early can inspire mental health issues for youth. Psychologists are observing anxiety and depression symptoms in younger patients. According to a Telegraph report, psychologist Lynn Evans, with 25 years experience, has noticed a significant increase in young patients (tweens and teens) who are in crisis and doing self-harm, such as cutting and anorexia. “And it always has something to do with the computer, the Internet and the smartphone,” she is quoted. Cyber-powered pressure is a major factor that can easily convince youth that their cyber-social realms are a single point of reference for life and validation. There is no doubt that the globally connected network creates a bully pressure of the manipulative and nefarious agendas of others which can convince us of things that don’t matter (i.e., the opinions of others about you, for example), and of things that are not true (i.e., my validation comes from the number of people in my network and the number of likes when I post). In this regard, social influences are a very real experience with which you and your child must contend as a united front. Many parents who withhold issuing the mobile phone to their young child have to defend the decision against a social reality that smart phones have become a normal or essential personal tool, like a pair of shoes or glasses. So without the clear and open communication about the value of setting boundaries for network pressure so you and your child can choose to be free from undue influences of the bully, the device and the drug in the social network is the most important strategy for parents, the desire of a child to have a smart phone before she is ready will become a power and control issue. To navigate around the power and control issues, develop a paradigm of being in charge of your own world (heart and mind) through learning how to use the smart phone as a communication tool that must be used purposefully, or you become the “tool” who is easily duped. Creating a sense of purpose around the use of the smart devices, and modeling what that looks like in your own use will help you and your child determine when the time is right to issue a smart phone for their personal use. It is possible to establish criteria for age-appropriate use of smart devices and mobile phones that also strengthen your relationship with your child. Below are some criteria for making a reasonably confident determination that the time is right to introduce a smart phone to your child. Explain that it is not simply a matter of age, but also a matter of purpose and maturity – giving your child something to aim for in personal growth, besides holding the device. 1. Has your child demonstrated that they understand mobile connectivity is not a right; rather, it is a privilege that requires training, responsibility and good judgment? 2. Do you have a family policy regarding privacy? Consider that the cyber communications are not private, even though children often believe they are. Parents must respect but not grant privacy to their children. Private is something personal you keep from the world because not everyone is trustworthy. While secrets kept from parents tend to harbor risk, harm and suffering. 3. Do you have a family policy in place for downloading apps? Introduce and maintain a family-approved app listing, wherein the applications every individual uses are listed, and before anyone downloads a new app, it is discussed. The family-approved app listing helps train your child to think of downloading apps as serious business. It could introduce problems in the form of malware, identity theft, and unplanned expenses. 4. Does your child demonstrate good judgment in his cyber communications with respect to language, gossip, and regulated use of the devices at home? Do you have trouble engaging your child in conversation about challenging subjects, like getting homework done and doing household jobs? 5. Is your child involved in multiple activities that require her to stay informed regarding schedules, assignments and coordinating events? 6. Is your child a good citizen at home? Does your child help out when asked to? Is your child demonstrating the values of trustworthiness including: honesty and kindness? 7. What is the parent motivation to issue the smart phone? If the decision is based on emotion, wanting to please your child and end the constant complaining that they are the only ones who do not have one, then you may want to consider the decision is premature. 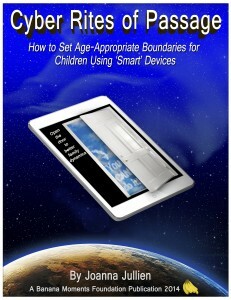 To learn more about setting age-appropriate boundaries for the use of smart devices, go to: Cyber Rites of Passage. 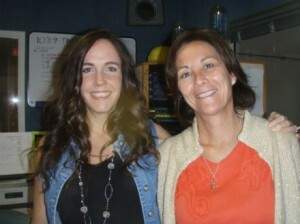 Posted in Boundaries, Discipline, Family, Internet Safety, Parent-child communication, Parent-child relationship, Parental Authority, Parental control, Parenting, Privacy, Social Media, Texting, The Fish 103.9FM Cyber Tues.